We've already looked at two immortal PC classics here on DOS Dungeon, so now it's time to dive into the other end of the pool and show off some of that infamous PC shovelware. Yes, like any video game platform, there was certainly no shortage of forgettable bargain-bin junk to be found on home computer formats. But we're going to go a bit deeper than that and dig up some schlock that brings back sour memories for both PC and console gamers alike. 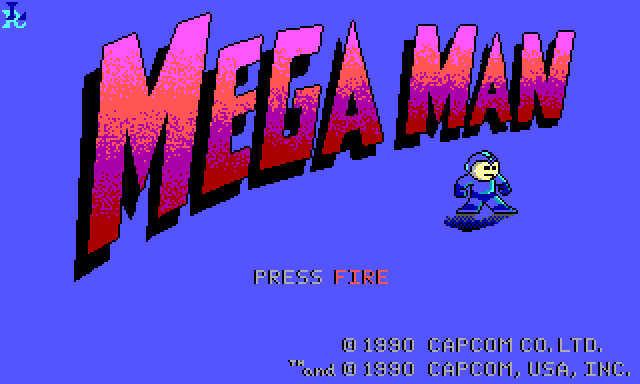 Yep, it's time to look at the infamous Mega Man games for DOS. These are not ports of the NES games as you may expect, but rather original titles that were farmed out to a small company called Rozner Labs for development. Appropriately, they were also published by Hi-Tech Expressions, a publisher mostly known for releasing low-quality games based on licensed properties. 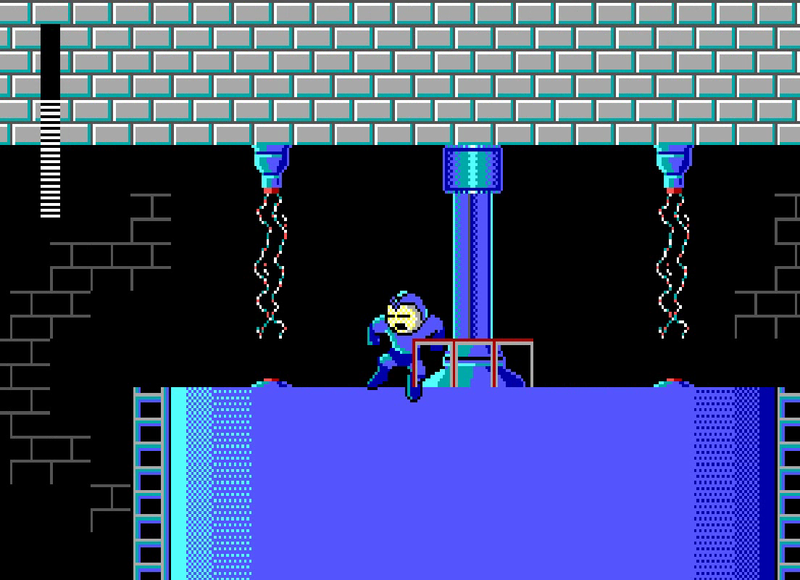 If you've followed my site for any length of time, you probably know that I am a huge fan of Mega Man. I've done playthroughs of every game in the original series, reviewed his comics (both the short-lived Dreamwave series and a full riffing of the infamous Brazilian one) and nearly all of his games have made an appearance on my various Top lists. Not to mention that virtually every time he comes up I'm quick to reinforce his status as one of the all-time greats of video gaming, easily on par with other legendary franchises like Pac-Man, Mario, Zelda and Metroid. 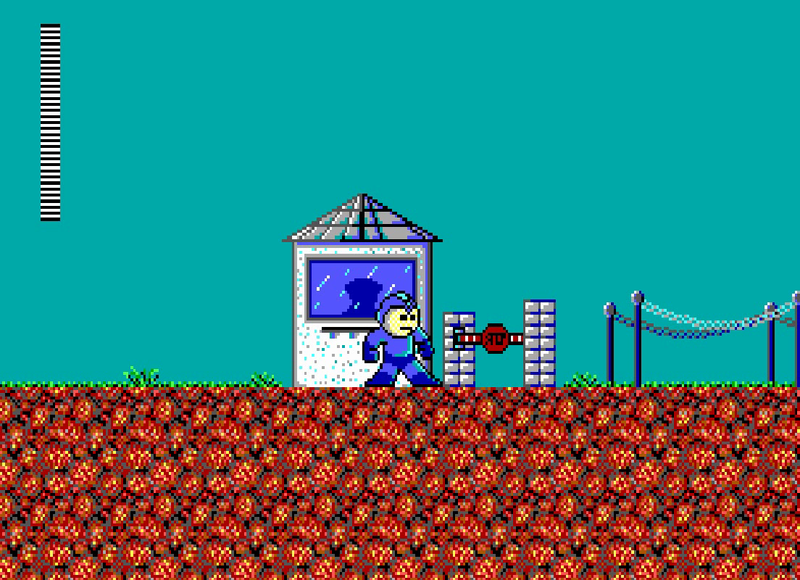 Mega Man games, to me at least, are synonymous with high-quality fun that appeals to all audiences - simple to pick up and play, yet very challenging to master. Hell, if you get more sequels on the NES alone than most franchises get period, you're definitely doing something right. 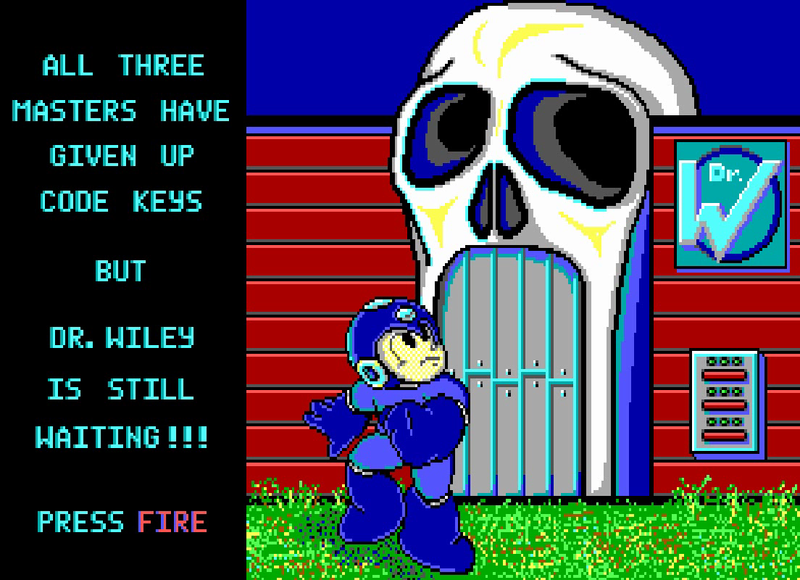 Still, Mega Man's history definitely isn't perfect; the franchise fell into decline in the early 2000s with some very mediocre sequels and spinoffs and remained there for the better part of a decade, finally pulling out of that rut with the nostalgia-tinged cross-platform release of Mega Man 9... only to once again get the shaft as Capcom cancelled several of his upcoming games and the designer and producer of the series left the company to create his own spiritual successor. But while even the weakest of Mega Man's console games have their defenders, you will be very hard-pressed to find someone with anything positive to say about his two PC-exclusive offerings. So let's take a closer look and see exactly why that's the case. Well, the problems set in the second you boot the thing up. 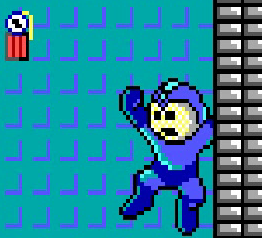 That derpy looking Mega Man on the title screen is in fact his in-game sprite. Well, as bad looking as it is, it animates tolerably well. 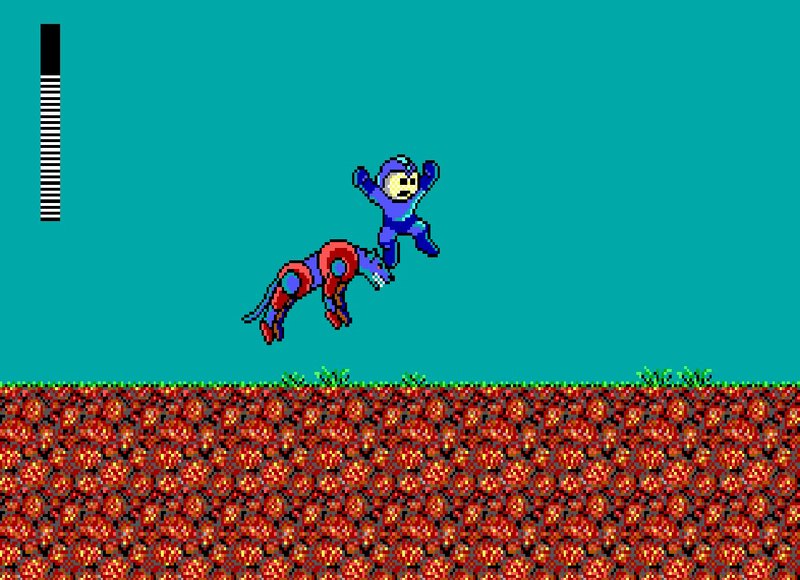 At least they tried to recreate the walk cycle from the NES games. 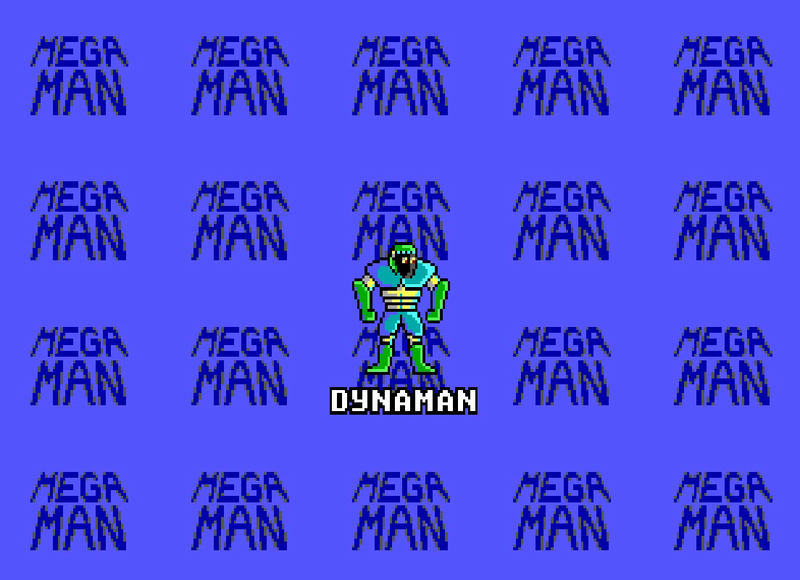 As the game begins, you're not immediately put on the Robot Master select screen as you'd expect. Instead, you're dropped outside a security gate and have to run forward into a building. While being pursued by these awful wolf-bots that assault you every five steps, are too stubborn to die and are immediately replaced as soon as you kill one. What does this have to do with anything else in the game? I have no idea. I should also point out that the controls in this game are absurd. The arrow keys to move and Space to fire is fairly self-explanatory, but J to jump? Escape to pause? The first letter of the weapon you want to equip to leave the pause screen? I know that this was a PC game, but you couldn't have gone with something a little more intuitive for a game patterned on a console release? Like say using CTRL and ALT for jump and fire? 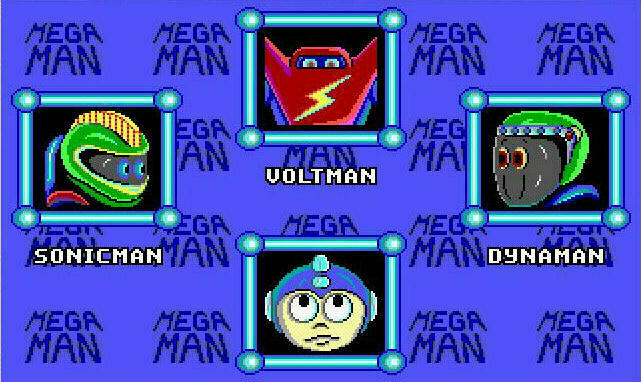 ...That there are only three Robot Masters. Not eight as per the series norm, or even six as per the original game. Just three. All of them also just look... odd. Their proportions are all off-kilter and their designs don't seem to match their names or indeed any particular theme, with the lone exception of Voltman's prominent lightning bolt. It's amateur hour all around with the art design in this game, but nowhere is that more apparent than here. One of the game's other glaring flaws is also on display from square one: a complete absence of music and only bloopy PC Speaker sound effects. In a series known for its iconic music and sound effects. I know PC sound technology at the time was limited, but come on guys, you certainly could have done better than this. We'll start things off with Dynaman's stage, I suppose. 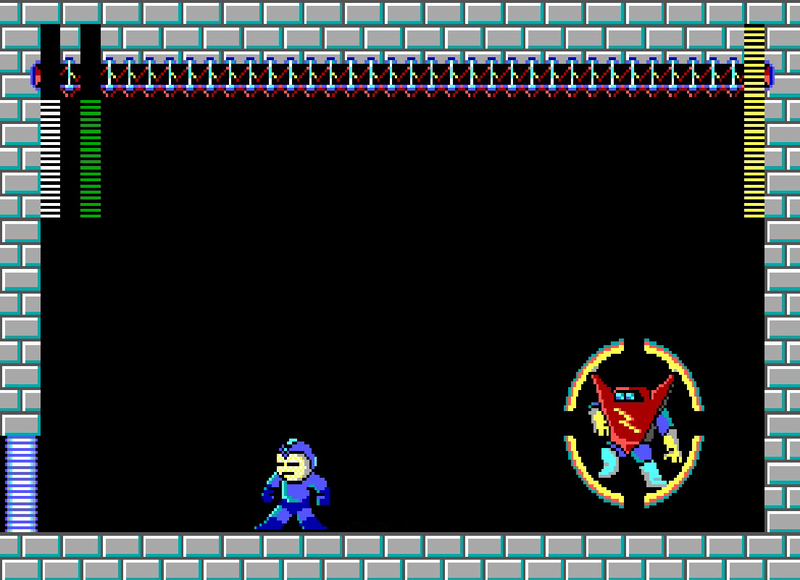 Not that it makes much difference since Robot Master weapons rarely prove useful in this game anyway. 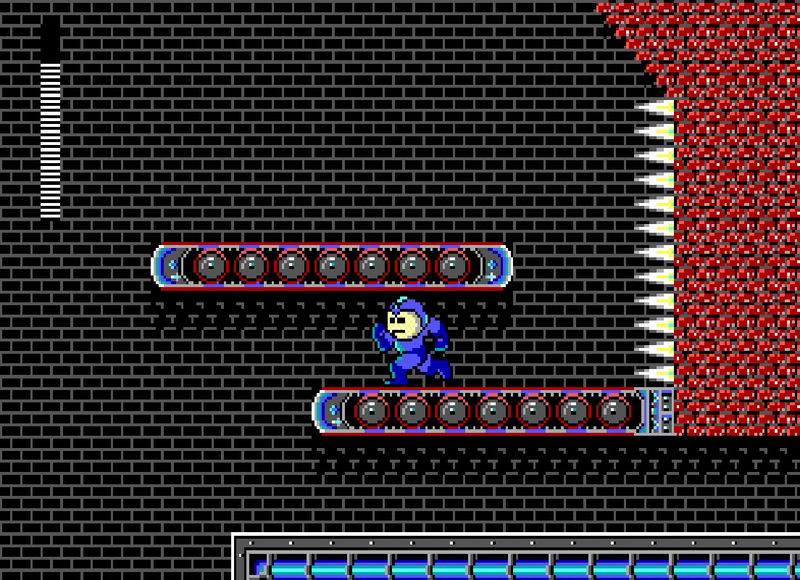 Dynaman's level is a rather generic factory stage, replete with conveyor belts, dropping blocks, giant insect enemies in the form of bees and ants. 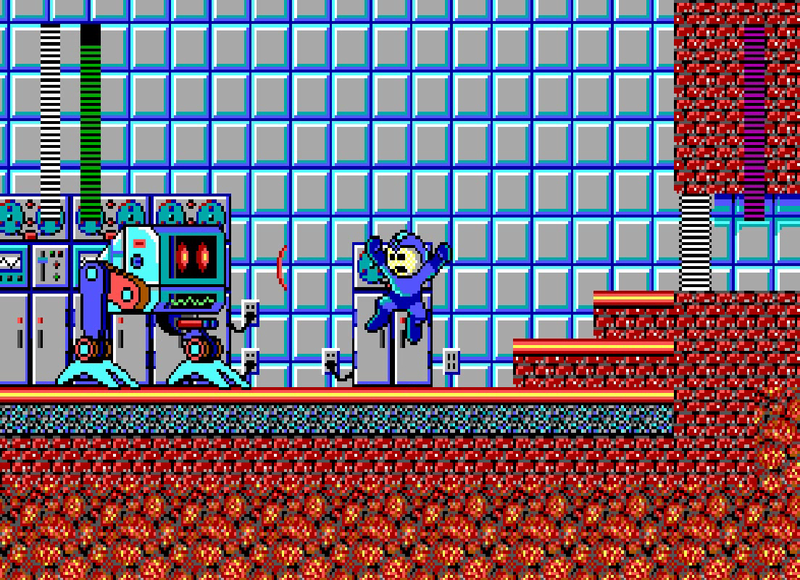 Neither of which look particularly robotic, I might add, which makes them feel really out of place in a Mega Man title. I don't know, maybe Wily's budget for robot designs ran dry and he just took to bombarding insects with gamma radiation as a cost-saving measure. Also, some of these graphics look awfully familiar. If you fall into this particular gap, you're screwed. The lava isn't an instant kill on contact, so it teases you into thinking you can recover. But nope, both of those walls are too high to jump to. Oh, and throughout this whole area you're being bombarded by buckets dropping molten steel and small flecks of lava popping out of the pool trying to knock you off of those narrow platforms. Have fun! 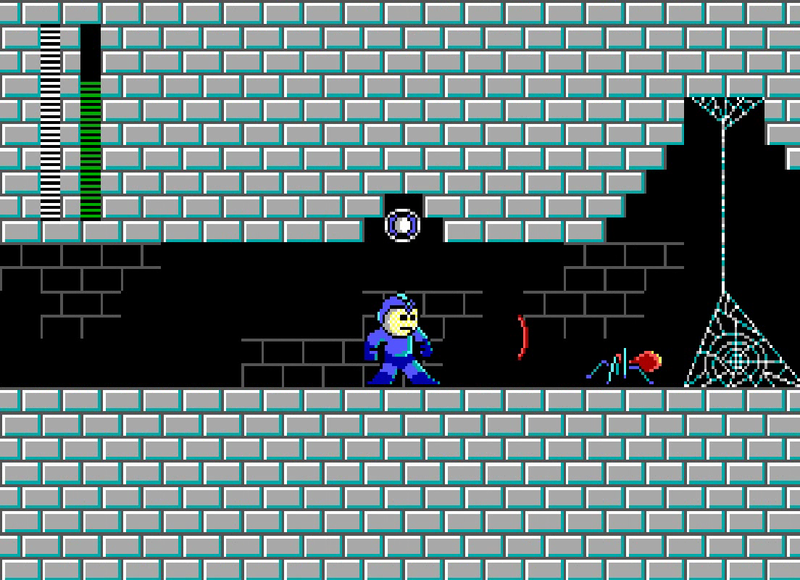 These ants are too low to hit with your standard arm cannon and there's a long series of narrow tunnels here, ensuring that if you don't have a special weapon, you're just going to have to take a ton of hits here and there's nothing you can do about it. Seemingly addressing this oversight in the laziest way possible, they put a large health powerup at the end of the tunnel. Dynaman has a rather simple pattern of bounding around the room (showing off a whopping two frames of animation) and dropping little sticks of dynamite straight down, which aren't particularly hard to avoid. None of the bosses have any kind of invincibility period, either, so just get in close and mash the fire button as hard as you can and Dynaman will go down rather quickly. As per the series norm, you then get his weapon, the Nuclear Detonator. You throw out what looks like a grenade, which detonates after a few seconds. Or you can detonate it early by pressing the fire button again. I'm pretty sure that's not how grenades work, but let's just go with it. Don't bother using the Detonator, by the way, as it has too small a blast radius to be of any practical use, especially against the Robot Master who is supposed to be weak to it. Oh, and there's no password system or save feature either. 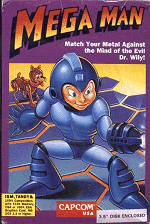 You get to beat the whole game in one go, NES Mega Man 1 style. Well, at least it's short at only four stages. Five if you count that pointless intro stage. I'm at a loss as to what a diver with an electric prod has to do with acoustics, but that's what we're going with. 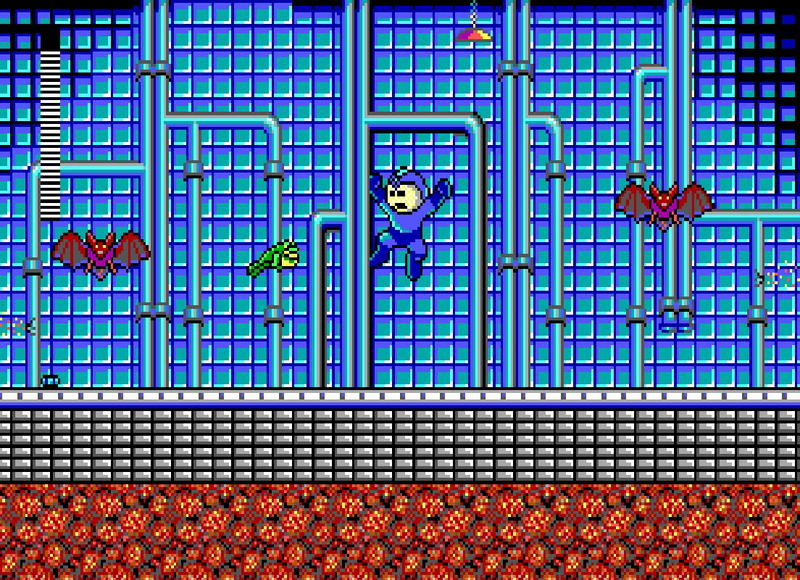 His stage isn't remotely sonic-themed either, just being a generic sewer level complete with bats and frogs that vaguely recall some enemies from Mega Man 2 and 3 on NES. Except that they look like real bats and frogs, not robots patterned after said animals. There are also rats that are, once again, too low to hit with your standard arm cannon, but they do pop their heads up every once in a while to put themselves in range. Now why couldn't they do that with the ants from the previous level? How did these guys stay in business long enough to create Duke Nukem 3D, exactly? In any case, this is yet another annoying section in the stage. 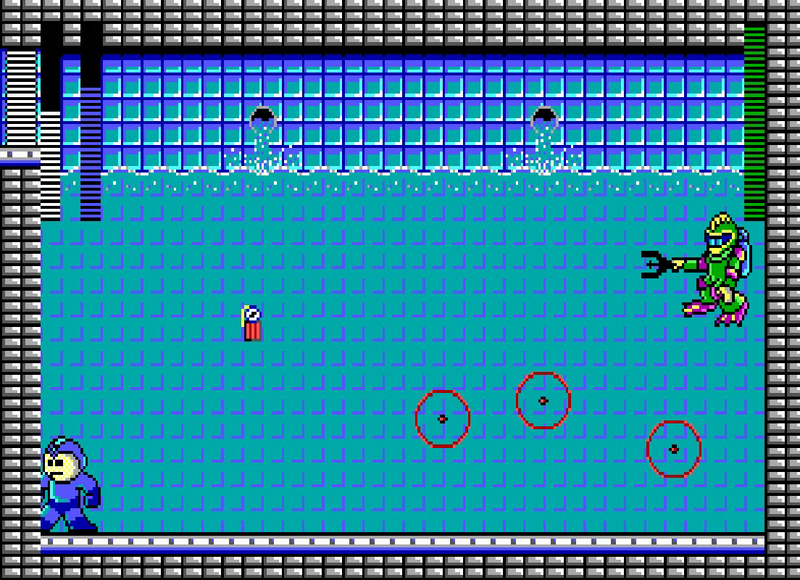 Those fish take several hits to kill, come in waves that you have to carefully time jumps to avoid, and climbing up any of the ladders usually results in you running headfirst into a rat you couldn't see because it was just barely offscreen. Aye. 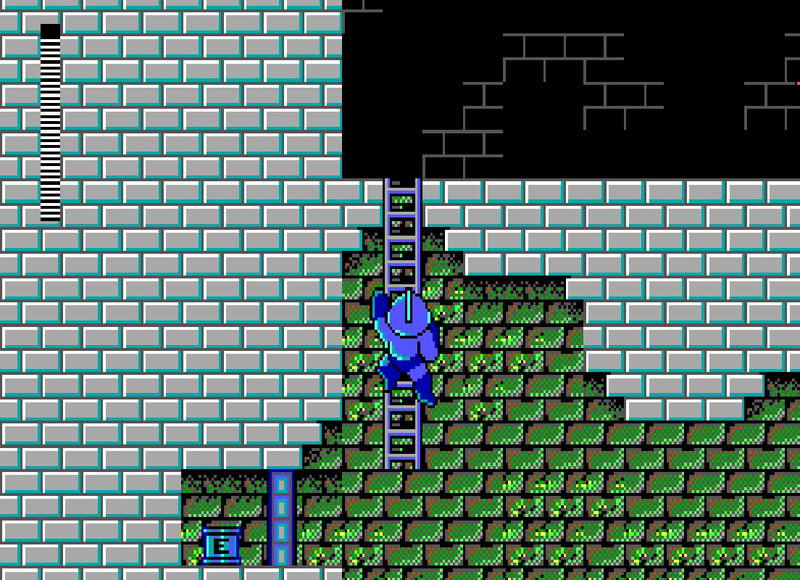 After that rather grueling section, you have to climb up a passage full of fire-launching pipes? While you're positioned near the top edge of the screen so you can only barely see them coming? Yep, Sonicman's stage is just brilliantly designed all around. Well, at least the rest of it is rather easy after this. 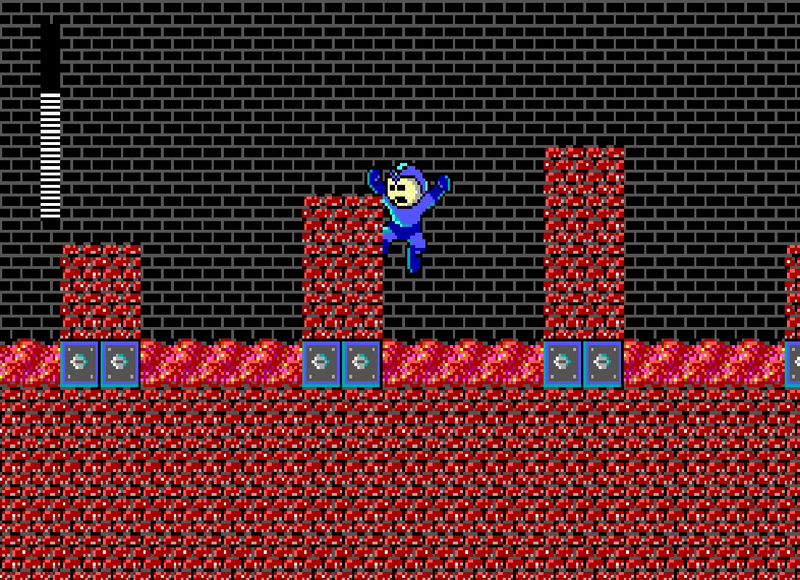 Sonic Man is a loose knockoff of Bubble Man from the NES Mega Man 2, simply zig-zagging up and down across the screen while periodically dropping three little spheres that will damage you on contact. 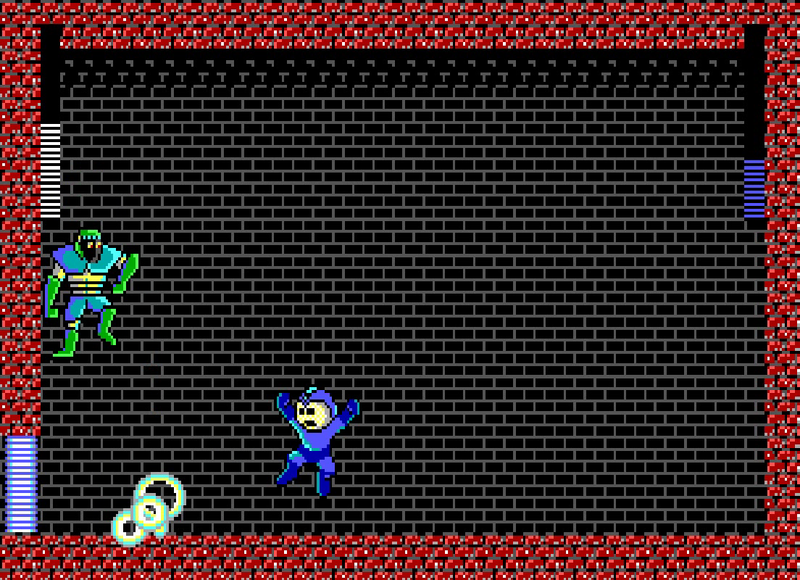 His weakness is technically the Nuclear Detonator, but as with all the bosses in this game, it's easier to just use your standard arm cannon and button-mash him to death owing to his lack of recovery time. Defeating him actually earns us a fairly useful weapon in the Sonic Wave, a large wave that can hit enemies normally to low to reach. It will also ricochet off walls diagonally in a manner resembling the Gemini Beam. Now let's move on to our third and final Robot Master. Wouldn't you know it? 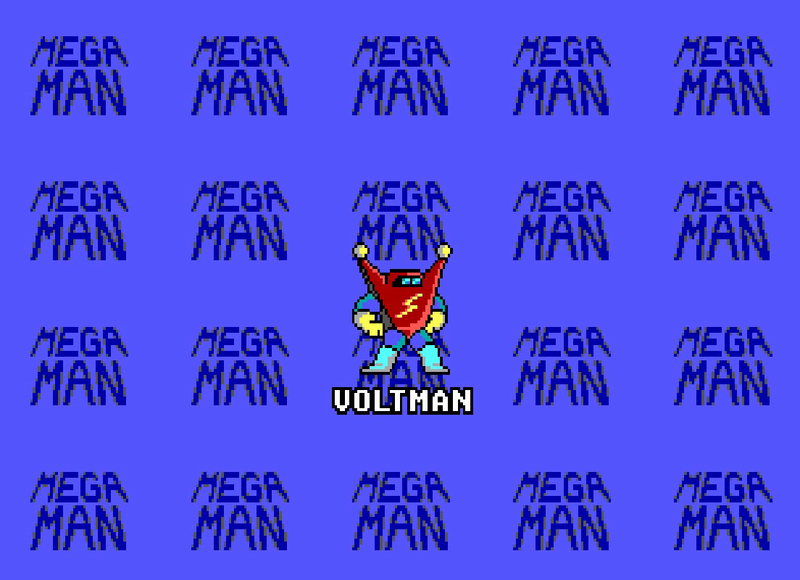 Voltman's stage is the only one that follows his character theme well, taking place in a power plant level replete with power lines, electrical hazards and turbines. 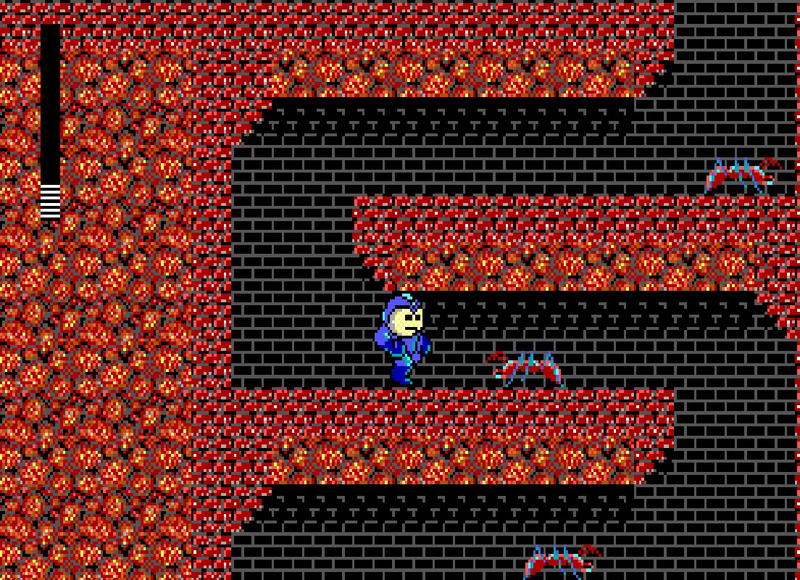 The enemies are still out of place (consisting of mosquitos and parrots) but at least this feels a bit more like a proper Mega Man level. This stage's requisite annoying obstacle are these turbines. 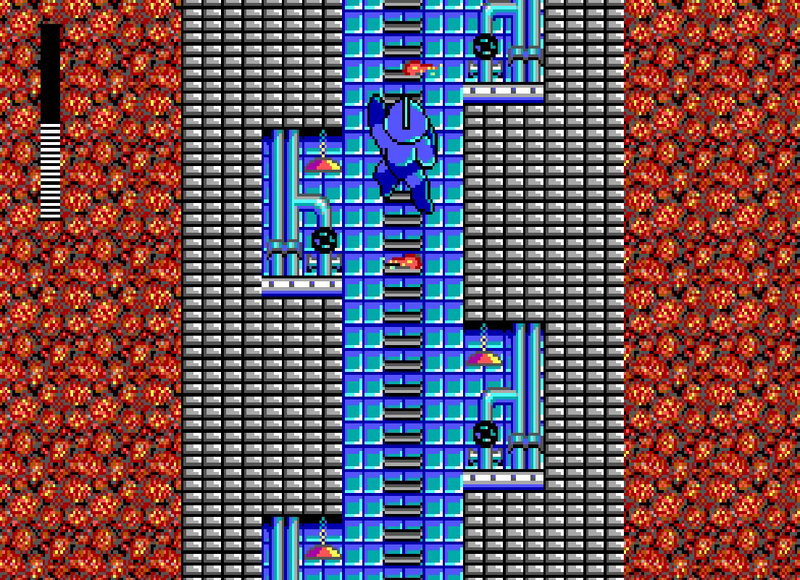 You're constantly being dragged toward the column in the center, being bombarded by insect enemies with a spread shot that's all but guaranteed to hit you, and bolts of electricity intermittenly appear from the two spots on either side. So you've got to clear out the enemies, then carefully time a couple of jumps to get through the beams in between firings. Get hit and you get pulled back to the center to try again. Argh. Right after that, we end up in the sewer fighting... spiders? Oh come on, you're not even trying now. They're yet another too-low-to-hit enemy, but thankfully we have the Sonic Wave to deal with them. I should also note here that the game seems to be fairly generous with 1-up drops. I've gotten a good three or four of them in under a half-hour of gameplay. Could this be the developers throwing us a bone to offset the ludicrous stage hazards? This is also your chance to score one of the only two E-Tanks in the game. (The other was in Sonicman's stage, but it requires a near-impossible jump). Just hold left as you drop off the top of this ladder and you'll grab it. After another lengthy stretch of tedious platforming, we come up to Voltman. He too hops around the room in a predictable pattern, but he manages to mix it up a bit with his weapon. A shield weapon that he surrounds himself with, firing off in six directions once he comes to a stop after a few jumps. That's your opportunity to unleash hell on him either with the arm cannon or the Sonic Wave, which you can spam on him just as easily and which will take him out in no time flat. Mets and Sniper Joes! Two of the franchise's most iconic enemies, only seen in the final stage and seemingly stuck in as an afterthought. When you come to a room full of powerups, that's your cue to heal up, as the final battle is just ahead. I'd definitely recommend topping off the Sonic Wave at least. The penultimate boss of the game is CRORQ, who looks like an 80s era Macintosh computer on chicken legs. Like the rest of the bosses, his pattern is very simple - he simply walks back and forth across the room, firing bullets in groups of three - one low, one straight ahead, and one angled upwards. Easy to avoid. If you start to get backed into a corner, climb up the small steps and jump over him as he approaches. Then just shoot CRORQ in the eyes with the Sonic Wave and he should go down rather quickly. 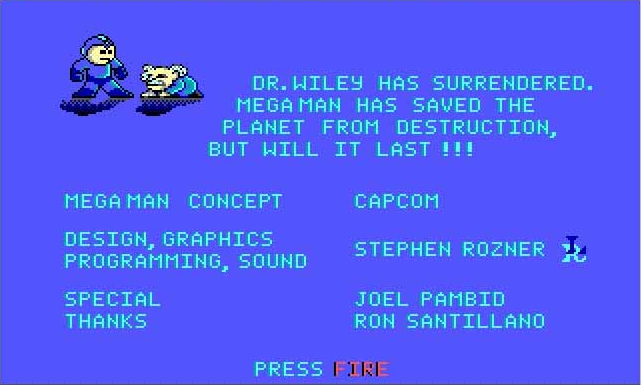 Once CRORQ's front panel is smashed, Dr. Wily Wiley will be revealed inside. Disappointingly, he makes no effort to change up his attack pattern or anything; he still just slowly stalks towards you and fires bullets in groups of three. He also doesn't seem to be weak against any particular weapon, but like every boss in the game, he has no invincibility period between hits. So just stay on the steps on one end of the room, mash the fire button as he approaches, then jump when he gets too close. Rinse and repeat two or three times and he'll be defeated. 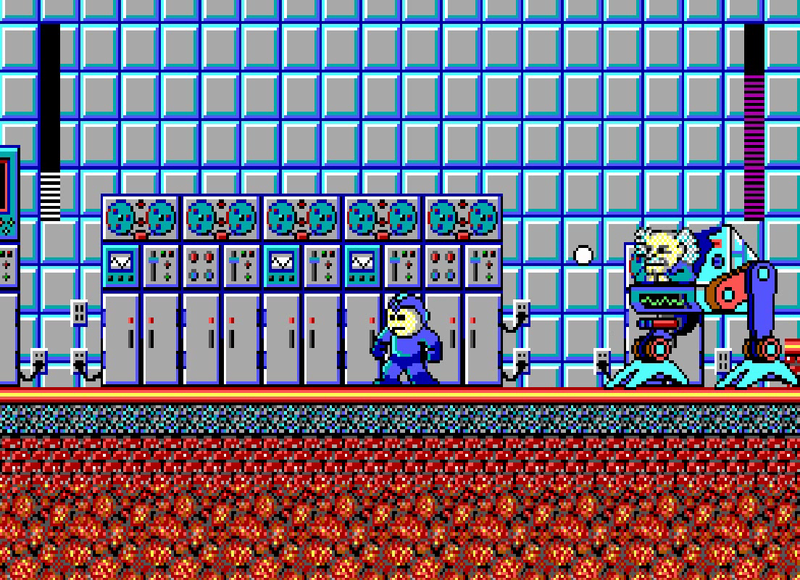 Despite Mega Man's massive problems, however, it apparently sold well enough for Capcom and Hi-Tech Expressions to commission a sequel, leading to a second PC Mega Man game in 1992. With that two-year gap between sequels, did Steve Rozner manage to polish up his craft and make a game that fared better than the original? Tune in next week to find out.